After sailing through the remote islands of El Nido all the way to Coron with Tao Expeditions for five straight days, I was desperate for a well- deserved break from roughing it. So I planned to end my 15-day Palawan voyage with a relaxing retreat at the world renowned Two Seasons Island Resort. I wasn’t going to leave Palawan without seeing this piece of paradise. Nestled in the idyllic islands of Coron, it is a perfect example of what a world class eco-friendly luxury resort should be. 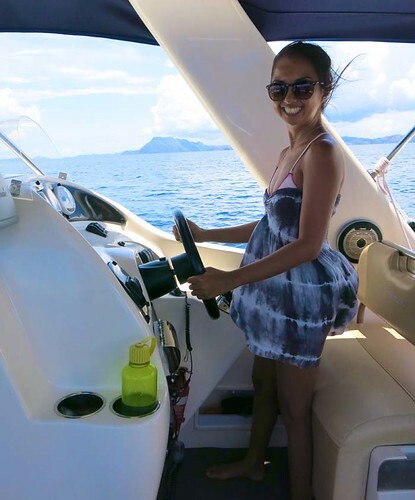 I invited my friend Joana- diver, stylist and jewelry maker to rush back from her diving trip in Malapascua and Balicasag islands so she could join me for a girlfriend getaway. From Coron town, we jetted off to Maloroyroy island in a speedboat. The captain felt my enthusiasm to drive and even let me try for a bit! As we slowed down to approach the island, I remember daydreaming about this place many times over. But having the privilege to see it up close, I was simply blown away by the beauty of the coastline. Each villa was thoughtfully built along the entire 200 meter stretch of sand with such minimal impact on its natural environment. Our speedboat inched its way toward the boardwalk, and the General Manager, Mr. Bautista, along with the reception team were waiting for our arrival. As the midday sun rose higher, each one of them held an umbrella which they shared with us. Even the most highly rated resorts that I recently visited in the Maldives didn’t quite have that special welcoming touch. After a delightful chat over our welcome drinks, the hotel buggy drove us to our home for the weekend, an Island Tip Villa. As its name implies, the bungalow is on the very end of the island, so it has stunning views of the west and east side beaches. A king sized bed, hardwood floors, an indulgent bathroom; the craftsmanship of every piece of detail in this villa is impeccable. We played endless chill out beats on the iPod dock while lounging in our very own jacuzzi that overlooked the sunset ocean. Only a few steps down our villa leads to a secluded beach cove, dotted with coconuts and frangipani trees. A short walk further down takes you to the sandbar that appears during low tide to the neighboring Bulog island. On the far right from our villa were untouched mangroves that were home to different bird species. 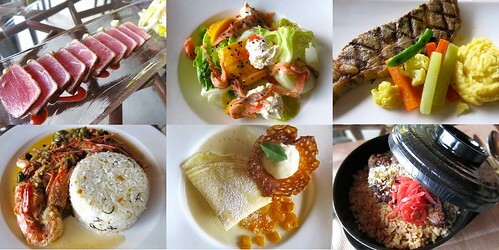 Being so far away from civilization, I was very impressed on how their restaurant, Sulu has so much variety on their menu. It includes local Filipino comfort food, Asian favorites and Continental best sellers. Every dish we sampled was a mouthwatering delight from the freshly caught ahi tuna, the perfectly done steak and their sinfully sweet deserts. We really looked forward to every meal and merienda time because we wanted to try everything on the menu and almost did! In the afternoon, we would try to burn off calories by doing yoga on the beach, paddle boarding or kayaking across the calm turquoise ocean, admiring the marine life that thrived down below. Two Seasons offers a variety of water activities from diving, catamaran, banana boat and even wakeboarding. Guests may also borrow snorkeling gear, SUPs, sea kayaks, pedal boats at anytime with compliments of the resort. Aboy, the Recreation Manager of Two Seasons shared that when he first snorkeled around the island, he was disheartened to discover that the corals were bleached and damaged from previous dynamite fishing. Now, different species of fish swam around a variety of healthy corals. Hundreds of huge starfish rested along the shallow waters. Apparently, the island is also a sanctuary for turtles and giant clams. We also saw some blue spotted manta rays on our way to the neighboring island of Bulog. On our last night, we were treated to a blissful massage at the Narra Spa, a set of interconnected native huts craftfully designed for some indulgent pampering. 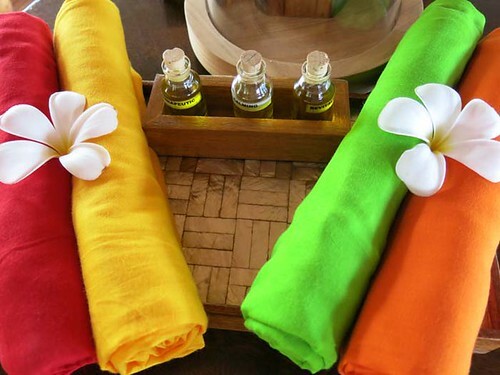 Upon arriving at the spa’s reception, we were made to choose a sarong that we could bring home as a souvenir. The Isla Huna massage, inspired by Hawaiian tradition was the most relaxing massage we’ve had in all of our spa experiences. My lovely therapist Gemma, generously poured coconut oil on my body. I felt the rhythmic dance-like movements of her palms, knuckles and forearms in synchrony on my entire body. This massage is a nurturing touch that revitalizes your energy, improves blood circulation, and stimulates your lymphatic system. I definitely felt a transfer of a positive sense of well-being and good vibes, drifting in and out of nirvana during the two hour long treatment that I didn’t want to end. What sets Two Seasons light years apart from existing resorts, big or small, is that it’s a 100% self-sustaining island development and vows to stay that way. 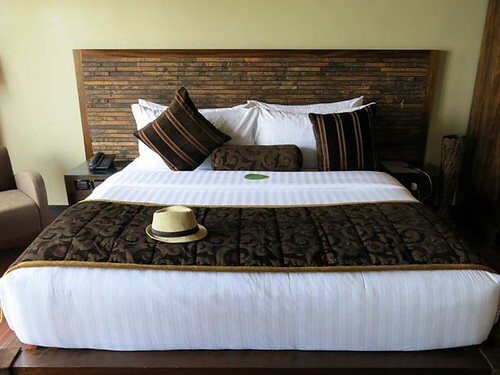 They are well aware of their responsibility to protect the environment and have built every facility as eco-friendly while letting their guests enjoy nature in ultimate comfort. We wanted to visit neighboring islands but was quite disappointed to hear that they are now restricted from the public because they have been bought by developers. This side of paradise is now being set up to be the next Boracay whether we like it or not. We could only hope that future island resorts will have the same eco-friendly development and operations. 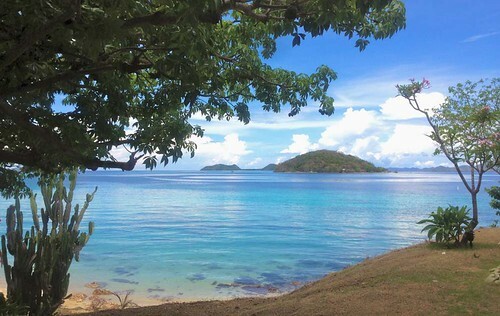 Like many islands in Palawan, energy and water are not readily available from any utility company, so Two Seasons basically has to make their own. They convert seawater to nonpotable water through a filtering process. It has cistern tanks that collect and store rainwater for watering the vast lawns and gardens. The entire resort is powered by generators that operate in intervals depending on the occupancy rate. Solar Panels are used to power water heaters as well. Wastewater is processed in such a way that the output is clear and clean enough to be diverted back to the bathrooms for flushing with the use of double piping system, a worthwhile investment that every new structure should have. 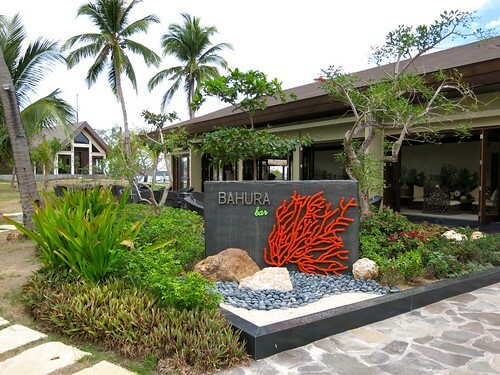 The resort is ultimately a zero waste establishment, an accomplishment that we Filipinos can truly be proud of. Special thanks to Mr. John Peñaloza, the owner of Two Seasons Island Resort and the warm staff for letting us experience this dreamland! Adi escaped from the corporate life and her life now happily revolves around yoga, surfing and traveling. Her goal is to live an eco-friendly lifestyle and inspire those around her to do the same. She shares her AntiGravity and yoga practice everywhere she goes and dreams of building Secret Spot hostels in beautiful tropical destinations. Her goal is to speak Spanish and Indonesian by the end of the year! Follow Adi's adventures on Love the Search. hi there Adi. when did you do the tao expedition? that was awesome. Did that as well April this year.